What a great new review by a customer on Amazon for the Exquisite Zodiac! Wahoo! 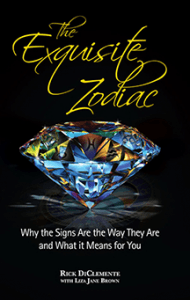 “Having never looked much deeper into Astrology or the Zodiac than the very basic horoscope, I was surprised when I read this book. The book was recommended by a very close and trusted friend during a discussion on ‘finding’ and understanding ourselves. Did I learn more about myself after reading this book? I sure did! I learned why my zodiac sign doesn’t always ‘fit’ me and why I sometimes act out of character (who I think I am). I have now sourced out my birth chart and am looking even deeper still. Knowing all the elements, all the signs, is what astrology is really about – not just those light-hearted daily horoscopes – I see that clearly now. I also found that I have a little more compassion for others on their journeys. I feel as though I can see the people around me a little clearer – what drives them, what they’re searching for, and the myriad of traits that make each one of us unique. So many have been stressing so hard recently. There are so many astrological “reasons.” But, when I really got to thinking about it, it all comes down to each of us individually, family-wise, collectively, in every way: our Moon being unable to keep up with Neptune’s nature. It’s really that simple. When any entity favors the Moon even to the point of trying to shove away Neptune, (which is totally impossible) it falls into the illusion that it CAN BE SEPARATE AND PROTECTED. By definition, that is not possible because true protection cannot come from the “family” as the Cancerian archetype mistakenly prompts; it can only come from Divine Grace (Neptune). This is not a possibility. We cannot FRACK without FRACKING ourselves. They are directly linked. It’s that simple. The word even sounds fucked up.